In a large skillet over medium heat, heat oil. Add onion and garlic and season with salt, pepper, and oregano. Stir in thawed and drained frozen spinach until completely combined. In a large bowl, stir together ricotta, egg, and Parmesan and season with cinnamon, salt, and pepper. 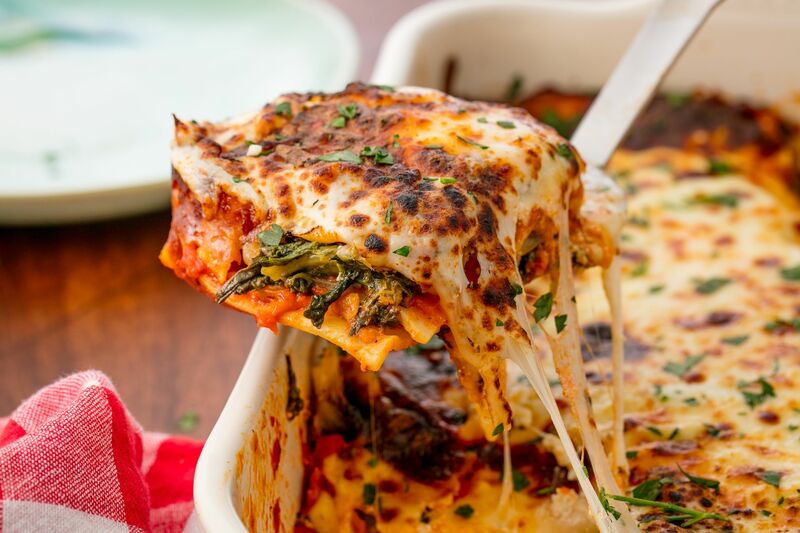 In a large baking dish, layer 5 lasagna noodles so they’re slightly overlapping. Spoon over a thin layer of marinara and top with a layer of spinach mixture and ricotta mixture. Sprinkle with a layer of mozzarella. Repeat, ending with mozzarella. Cover with foil and bake 45 minutes, then remove foil and continue baking 15 minutes more. Let cool 10 minutes, then garnish with parsley, slice, and serve.